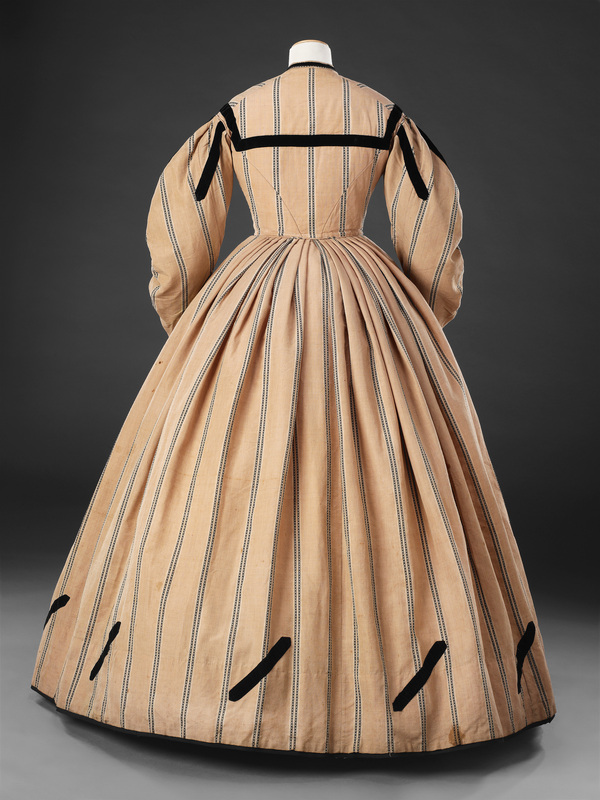 By the early 1860s the width of the skirt, supported by the crinoline frame, had reached its zenith. 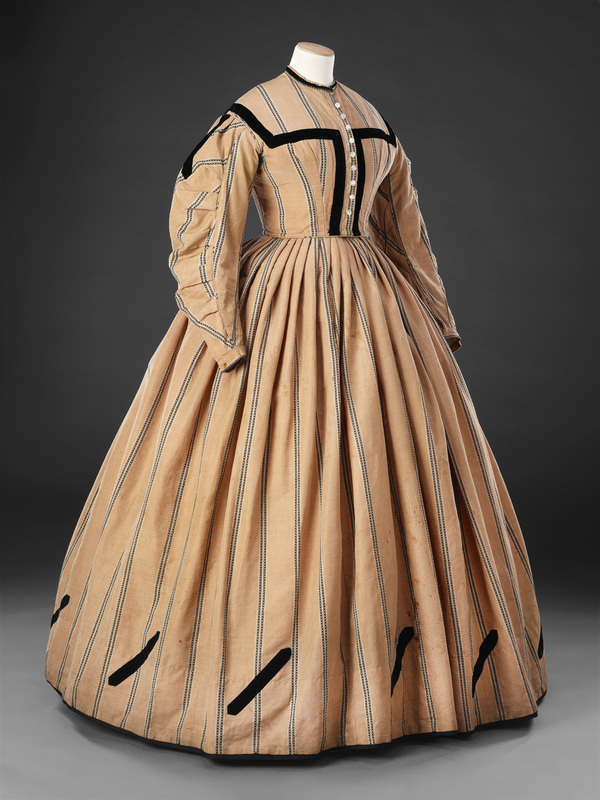 Such a surface area provided the perfect canvas for bold, decorative effects, and contemporary photographs, fashion plates and surviving garments show large designs of strongly-contrasting applied velvet or braid encompassing the skirt above the hem, echoed on a smaller-scale on the bodice. The maker of this unpretentious one-piece day dress has interpreted this fashion in a simple, but effective, manner. Black velvet ribbon has been stitched to the bodice to suggest a yoke, and diagonal strips of ribbon with pointed ends have been applied to the base of the skirt at intervals, and to the tops of the sleeves. 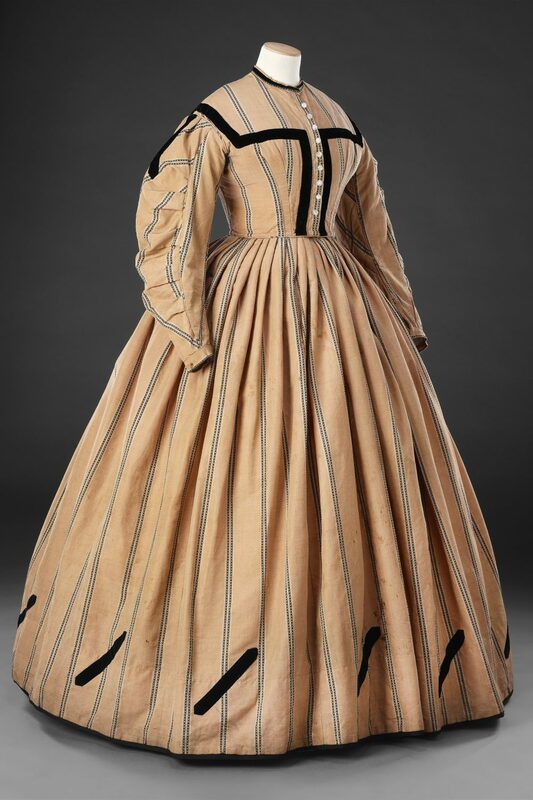 The dress has been made by hand from a worsted wool fabric, possibly incorporating linen, which has a slightly harsh but practical character; it is woven with bands of simple black pattern which have been matched symmetrically on both bodice and skirt. In common with many one-piece dresses of this date a small watch pocket has been inset at the left front waist seam. The dress’s one concession to complexity is the construction of the sleeves which are pleated into a piped curved seam running down the front of each sleeve.